Neil Gaiman writes about children coming of age in a dark and mysterious world better than anyone ever has before. 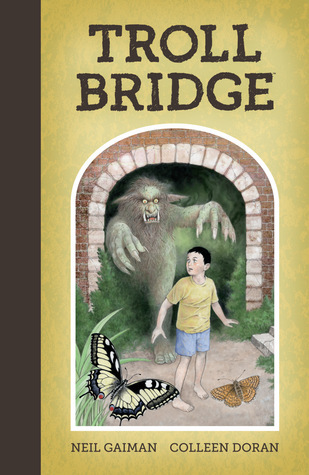 Troll Bridge is a deceptively simple, but tremendously powerful modern fairy tale in which our narrator encounters a troll while a young boy enjoying the outdoors. Though the troll hopes to eat the boy, the lad manages to talk his way out of being devoured, promising to return another time. Two more encounters take place with the troll in this 66-page, illustrated story. One of the many things I like about Gaiman’s writing is how natural and relaxed his stories are, as if the impossible is quotidian. And if you think you know where a Gaiman story is heading, you are likely to be surprised. He can take a natural event or story and twist it until it is a real surprise. Such was the case here (as it was with the last illustrated Gaiman book I read). Colleen Doran’s art really enhances this story, keeping the story rooted in the world that is familiar. How easy it might have been to make this eerie and creepy, but the power of the story comes from the fact that this isn’t some strange or different world. This young boy is you, or me, or Gaiman, or anyone we might know, which is why it has so much power. If you haven’t read a Neil Gaiman story before and want to try one, I’d highly recommend a graphic novel like this, beautifully illustrated, to introduce you to his world. Looking for a good book? Troll Bridge, by Neil Gaiman and illustrated by Colleen Doran is a wonderful modern fairy tale that appeals to readers of all ages.